Calling all you amazing birders! Found this little guy on my back porch wedged between the house foundation and porch. My dog was salivating trying to get to it and nearly killed him, but wasn't able to reach. So, my son and I pulled him out with some bbq tools and a pool net. Hauled him over to a little natural cradle in the tree and built him a little nest, safe from my dog. Any ideas what he is? He seems very hungry too. Perhaps a young Bewick's wren? Here's a photo of one in my yard from a few years ago. Thanks, lmre! That looks pretty darn close to me. Aarrrrrgh - baby birds are HARD to ID. Despite the similarities, I don't think it's a Bewick's Wren. Even a very young Bewick's would show some sign of the bold eyebrow above the eye and I don't see it at all. Second, the bill looks wrong. Wrens, even young ones, have longer thinner bills that complement their eventual hunting preferences. This bird also lacks the telltale barring on the tail that is already evident in Imre's photo. What this baby does share with Bewick's is the exceedingly white throat and breast: a rarity among birds. I've been staring at this photo for about 20 minutes and I cannot pin down the ID. The bright white underside really narrows down the choices. The lack of any clear facial marks like eybrows or eyerings is important, as is the absence of any nascent wing bars. The bill shape, and its distinctive patterning of very dark brown and yellow (proceeding back along the gape) are all important, too. The olivaceous tint to the primary wing feathers and in the tail are also telling. But, maddeningly, I can't pin the species. For a second I nearly spit my coffee, thinking it might be a fledgling Black-capped Vireo - a bird I have a LOT of experience with. But, nah, that would be a VERY rare find. It's much more likely to be a fairly common nesting species in your area. Your bird has a vague "flycatcher feel" to me, but I doubt you have any nesting by you, Casa Grande. I should probably have gleaned this from your previous posts, but where do you live? That is the essential starting point to ID-ing your bird. Whatever it is, it's probably not going to survive without a lot of attention and support from its parents. However, if you want to feed it something, try insects - soft-bodied caterpillars and larva are best, but moths and butterflies and grasshoppers and leafhoppers and crickets should work, too. Bread or birdseed won't work for this kind of bird. This bird also lacks the telltale barring on the tail that is already evident in Imre's photo. What this baby does share with Bewick's is the exceedingly white throat and breast: a rarity among birds. I gave up almost immediately. Immature birds are beyond my skill-set; don't even get me started with gulls. Agree that it isn't a wren based on bill dimensions, I'd be looking in the sparrow family. Thanks for the guidance guys. I live outside of San Antonio on the Northwest side, if that helps. And, yes, the bird died. My son was sure bent on saving him. It’s tough. I’ve tried to save a few at the request of my kids. Your chances are slim. That location info helps. That puts you just barely within the breeding range of Eastern Kingbird. I’m going to go way out in a limb and peg your bird as a late stage nestling of that species. I’m not totally comfortable with this guess. I’d like the bill to be a little darker and a little longer and I’d like to see the beginnings of a tiny hook at its tip, but Eastern Kingbird is a better fit than anything else I can come up with. Here’s a link to an article about the species. It includes at least one good photo of a fledgling. Once you read the article and put the photos in your mind, keep your eye out for adults roosting in the trees or on lines around your place or engaging in aerial flycatching. If they’re hanging around, then they might be the parents. Following up on my reply above, here's a nice page of photos of Eastern Kingbird with several of the young, some alone and some with adults. I think Blue Gray Gnatcatcher is a possibility, but size is not apparent from David's photo. This is more aligned to range and habitat than an Eastern Kingbird. I know, right? It can drive a person to drink. Outstanding analysis, BK. Range, of course, is the key to figuring this out. And secondly, size of the bird in question. David, if you can give us any hint on its size, that will help. Photos that give some sense of comparative scale would be best. You knew, didn't you, that when you asked for birders' help, you were plunging down a rabbit-hole of OCD? I, too, thought about Blue-gray Gnatcatcher, especially when assuming the incident had occurred near Big Bend. But I couldn't find any photos of nestlings. Yours, however, is excellent. I have to admit, BK, your photo looks an awfully lot like David's bird. And, in general, the gnatcatcher characteristics match David's photo. Whether kingbird or gnatcatcher, I think we'd both like David's bird to have slightly longer and thinner bill, though the gnatcatcher most of all. The ringer for me, though, is the eye. Gnatcatchers are going to grow up to have that nice, sharp, bright white eyering. If you look at your photo of the gnatcatcher nestling, the nascent eyering is clear visible as an circumorbital bare patch with feather follicles just beginning to erupt in a sequence subsequent to the main head feathering. If you look at David's photo (or the many links I provided to photos of kingbird nestlings and fledglings), the orbital ring, such as it is, is far less pronounced and doesn't look to be less advanced than the rest of the head feathering. I don't think David's bird was going to develop an eyering. It's all a mystery. Only bourbon can make it tolerable. Lol.... you guys are funny (and great)! It was a pretty small bird, I'd say about 3 inches at best. The natcatcher I'm not sure of because my bird's breast is too white. That's helpful! 3 inches seems small, but it's actually fairly large for a bird at this early stage of its life. The Blue-gray Gnatcatcher is a tiny bird whose adult length from tip of bill to tip of tail will only be a little over 4 inches - in other words, not much larger than your bird was when you found it. Eastern Kingbird, on the other hand, will max out at around 8.5 inches. Your bird sounds like it was going to grow up into something moderately large, closer to kingbird size. As we've all said here, ID'ing baby birds is really difficult. In the field, one would have a direct sense of its scale, comparing it to other known birds, and a perfect view of the shapes and plumages (which change REALLY rapidly in the first few weeks of a bird's life) which could be examined from many angles and firmly established, some behavior might be noted, the surrounding habitat would be known, a nest or nearby adults might be found. 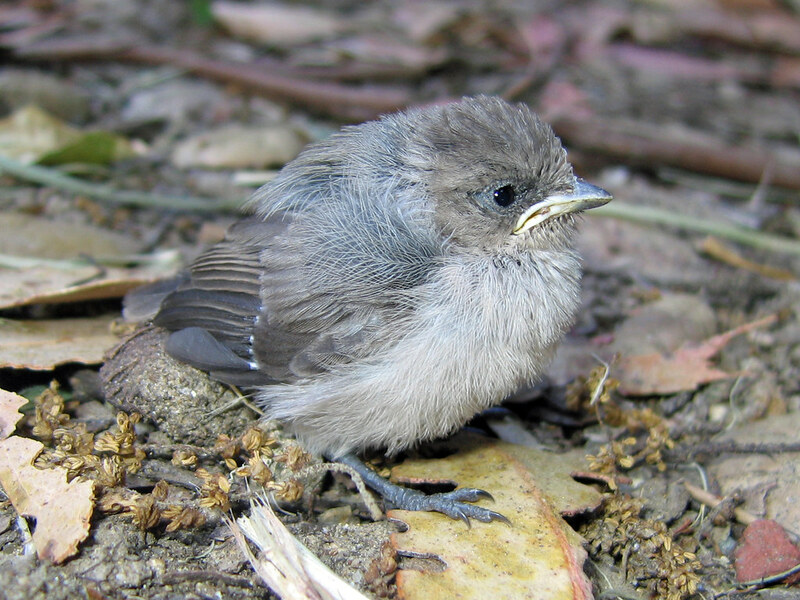 But making a guess on a baby bird (as opposed to an adult) from a single photo, without all that other information, is really, really tough. I'm still inclined to say this is an Eastern Kingbird nestling on the verge, but not quite ready, of fledging from the nest - not quite two weeks old. The bill, above all, has been giving me pause, because I would expect it to be longer and a little sleeker, but looking carefully at your photo, David, I've come to the conclusion that the angle of view foreshortens the bill, making it appear stubbier than it probably was. I'd like to see the beginnings of a little hook at the end of the upper mandible, but there's a small light flare there that makes it hard to see well. That's all I got. Unless you see the parents still attending some surviving young at the original nest, or starting a new one, we may never really know the ID of your little bird. Stuffed Kingbird....now that's some good eatin'. Not much there, but what's there is choice. I used to prepare bird skins for study. Not stuffed, but gutted and cleaned and then filed in drawers. They did NOT make for good eatin'.